Golden Coast / News & Offers / Sales & Marketing / Blog / How might the 2012 Olympics affect my wet leisure business? From 27th July to the 9th September, sport will dominate the UK media. The Olympics will have a huge impact on the British media, and there is the hoped for promise of a huge impact on the British economy. In some ways, the biggest direct effect will be felt in London itself with 11 million spectators, half a million of them coming from overseas, descending on the capital and the South East. However, across the whole country the Games are expected to create a positive mood amongst the public encouraging them to spend more. 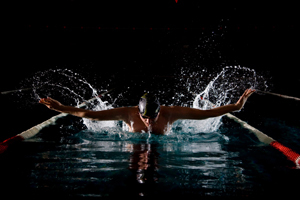 Another factor could be that although the Olympics is only in part about swimming and diving, the whole Games reflects an image of health, sportiness and wellbeing and these attributes at least can be found in all aspects of the wet leisure industry. Marketing with an Olympic theme and the law. You may well be tempted to jump on the bandwagon and use an Olympic theme to market your business. Of course, the major sponsors of the games have paid out millions in order to do just that and they protect the rights that they have bought aggressively. You will be breaking the law if you use the Olympic symbol or the London 2012 mascot. You will break the law if you use the words, ‘London 2012’ or the word ‘Olympic’ – or even words similar to Olympic like Olympix. ‘Gold’, ‘Silver’, ‘Bronze’ or ‘medals’ could get you into hot water depending on how they are used and what words are used in conjunction with them. The laws are complex and the penalties for breaking them can be fierce, so unless you have a professional marketing company to steer you through the minefield, it might be wise to avoid any direct claim to a connection with the Olympics or even suggest one. But as we’ve said, the media is going to be full of the Olympic spirit so, you will get away with, ‘ Soak in the atmosphere of this special Summer’ and people are going to know what you mean. You can show support for Team GB, you can use your Facebook page or your blog to start conversations about the Games, you can show that you are as excited and as interested in the Olympics as your customers may well be. Watch out for the licence. A lot of businesses might be thinking of installing a wide-screen TV so that their customers – and staff – can watch some of the Olympic coverage in their showrooms. This idea might be particularly well suited to a spa or hot tub distributor. If you are thinking of doing that, then you must have a TV licence for your premises. One area where the Olympics is bound to have a huge impact is the world of social media. The Games will provide a common theme that millions of people are going to want to talk and tweet about. Facebook and other social network sites are going to be full of celebration and commiseration at medals won and lost, records broken or retained. Marketing is always about a direct attempt to sell product or services, engaging with your customers, establishing common interests and building relationships is just as important and will pay dividends in the future. So get involved with that conversation, show that you share their passion for Team GB or perhaps someone from your area who is competing in the games. You can introduce competitions or promotions but make sure that they are fun and in the spirit of the moment – and, of course don’t break any of the rules and regulations mentioned above.